Chances are good if you’ve ever looked at any pictures of New England , you may have seen one or two featuring a white clapboard church. Those churches are as New England as chowder, fall leaves, and the Boston Red Sox and one of my most favorite things to take pictures of when I get the chance. On my recent trip to Concord I had the chance to take pictures of what could be called “a quintessential New England white clapboard church” when I came upon the First Parish in Concord Unitarian Universalist Church located pretty much smack in the center of town just up the road a piece from the houses of Louisa May Alcott and Nathaniel Hawthorne that I wrote about yesterday. A larger meetinghouse was constructed on land across from “Old Hill” between 1667-1673 and it too was eventually replaced by a third and even larger building in 1711. That building was renovated in 1791 and then again in 1841 when it was turned 90 degrees to the north to face Lexington Road – a practice that was not all that uncommon back in those days. 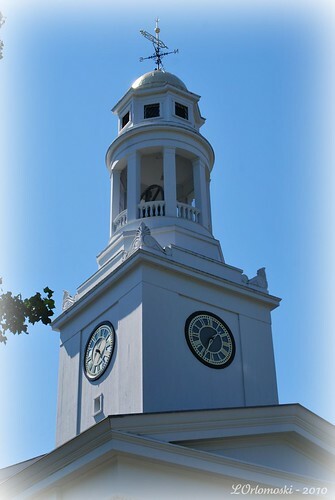 Fifty-nine years later on April 12th, 1900, the third meetinghouse burnt to the ground during a tragic fire that also caused the steeple bell to partially melt. 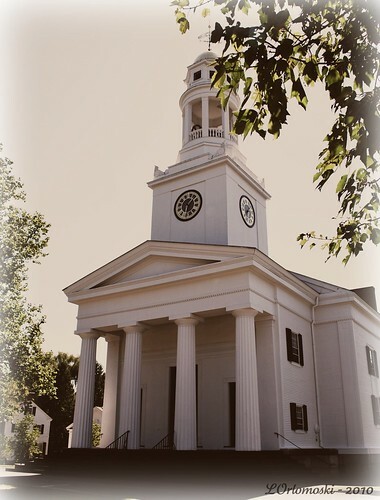 That bell is sitting on the lawn in front of the meetinghouse but do you think I was smart enough to take a picture of it? Sadly that would be ‘no’. 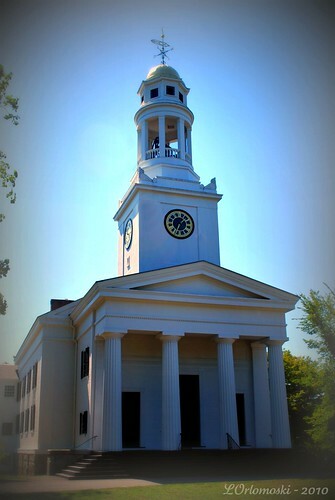 The rebuilding of the meetinghouse began that very same year and the fourth meetinghouse, a modernized version of the third, was finished in 1901. 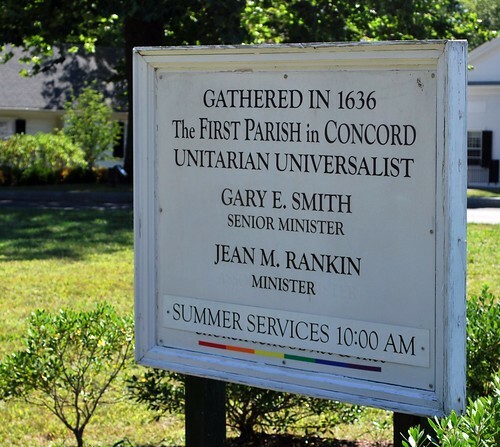 The First Parish was originally formed as a Puritan Congregationalist congregation whose minister from 1765 to 1776 was the Reverend William Emerson, grandfather of Ralph Waldo Emerson. 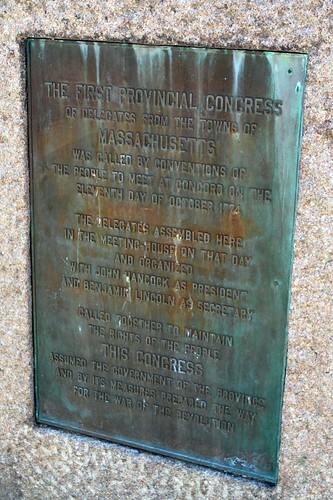 The Massachusetts Bay Provincial Congress convened in the First Parish meetinghouse several times in 1774 and 1775 and for nine months in 1775-1776, the church hosted the students and faculty of Harvard College from the uncertainties of war in Cambridge in the relative peace and safety of Concord . It was during the 69-year pastorate of Reverend Ezra Ripley from 1778 to 1847, that the First Parish grew away from its original Congregational Calvinistic roots and evolved to the more liberal Unitarianism, a nontrinitarian Christian theology which that holds that God is only one person, in contrast to the doctrine of the Trinity (God as three persons). From the First Parish's website: "We welcome all people to our faith community without discrimination on the basis of race, gender, age, color, national origin, ethnic background, socioeconomic status, marital status, disability, sexual orientation or gender identity. 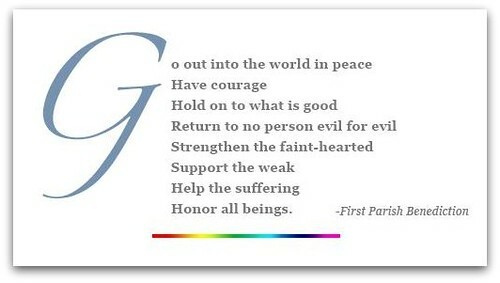 Grounded in our Unitarian Universalist principles and purposes, we affirm the inherent worth and dignity of every person." 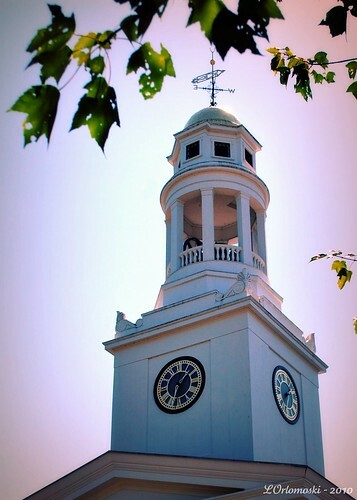 how ever did you get that gorgeous shot of the steeple? Telephoto? I love it. I think one of my greatest weaknesses as a picture taker is of large buildings. I just don't know what to do with them but you did a fantastic job! Interesting history post and as always beautiful photos, Duchess Linda of Norwich-Upon-Thames. The architecture of this church reminds me of our First Congregational Church in Derby, built in the 1800s. You'll have to see it some time. I need to catch up on reading your posts. New England is chock-full of wonderful buildings, isn't it? My sister bought a new camera for their trip to Italy... exactly the one I want! I can't do most landscape and buildings justice with my little P&S! You did an awesome job, as always! Since this is the closest we'll get to New England, I really do appreciate the photos and history lesson. Poor me. I was sooo looking forward to NH, but it was not to be...at least for now, so thanks for the eye candy. I love all your history lessons Linda. This one is no exception. I too think I'd fit in well in this church. Absolutely beautiful church and the closing does make you wish you could attend. Love the benediction. Is that a cellular antenna on top? I hope they get funds for the church from it if it is. You're right - the congregation sounds as nice as the building looks! Love your history lessons, and love your photographs even more! Very nice post. Beautiful pictures and wonderful history lesson.